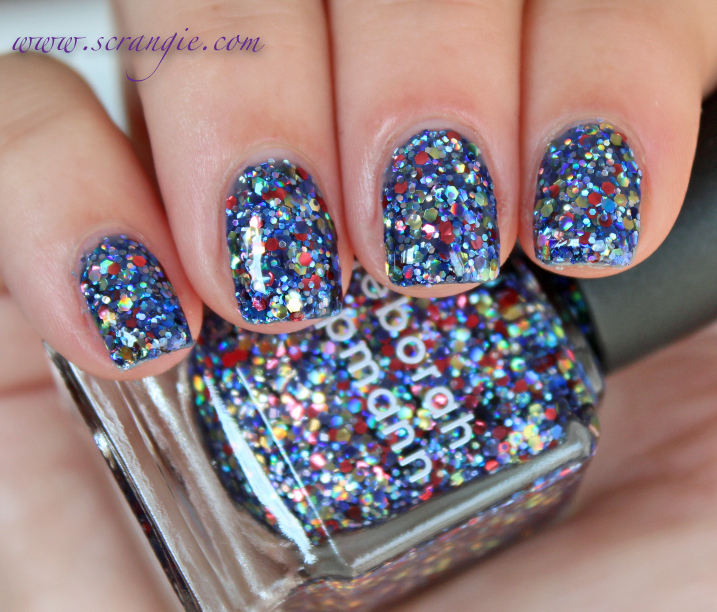 Deborah Lippmann Stronger (Created with Kelly Clarkson). 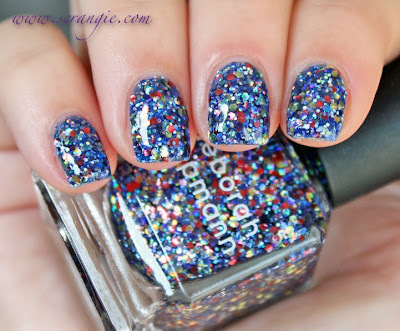 A strongly blue-toned purple jelly base with tons of multicolor, multi-size glitter. There's round and hex, metallic and holo, rainbow, silver and gold. Seriously, tons of glitter in here. The base is nice and sheer so the glitter doesn't get buried, and the jelly texture of it provides a little bit of depth that enhances the sparkle. The formula on this was chunk-city. It's very thick, very goopy and there's a huge amount of glitter to complicate things even more. This color requires the dabbing method of application to get an even layer of glitter. One trick I use to apply these types of colors is to press down the glitter after each coat. I wait about two minutes for the polish to set and become tacky, and then I gently pat down the glitter with my fingertip until it's all laying flat. This polish only needed two coats for opacity, but due to the thickness of it, dry time was long. Two plus coats of topcoat are required for a smooth, non-textured finish. The formula is a pain, but the end result is gorgeous. 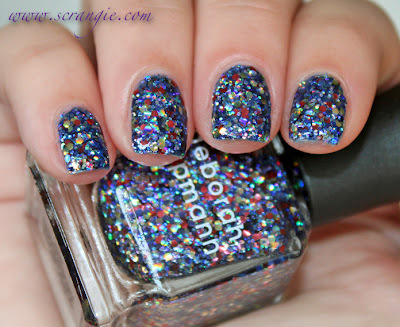 It is extremely sparkly, so much so that it actually looks like sequins on your nails. 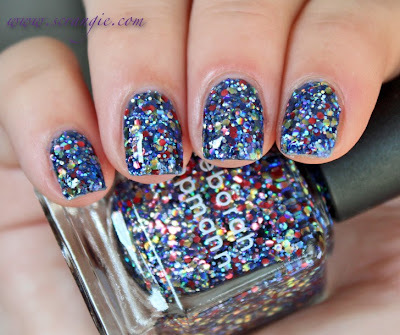 It's thin enough to be used as a layering glitter topcoat (or glitter sandwich), but can also become opaque if you don't mind dabbing the glitter on to create coverage. It's thick, it's lumpy, it takes a long time to dry, but damn. It's crazy pretty. By the way, if you haven't heard the news, Lippmann is back at Sephora (that's where I got mine). That means you can get all the perks of ordering at Sephora (Beauty Insider points, free shipping, samples, promos) when ordering it now. Woohoo! I hate formulas like this but WOW it is spectacular! So beautiful...worth the application issues IMO!! Awesome! This polish is so gorgeous! 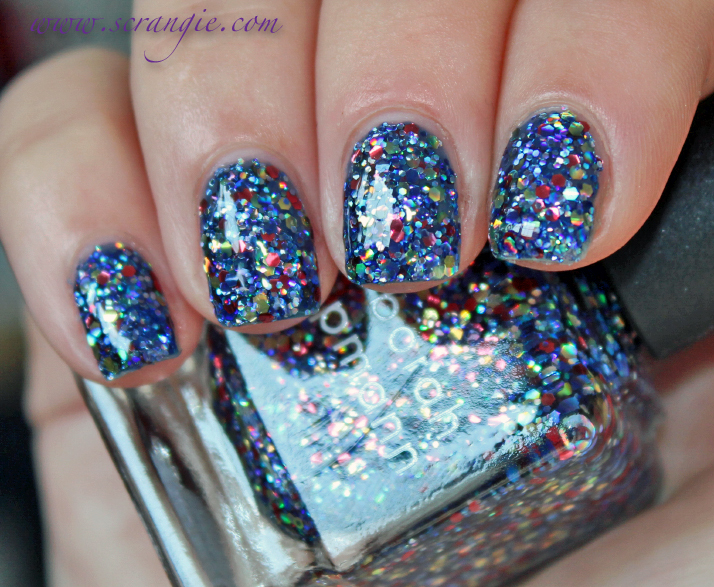 Such a festive glitter! Great swatch! I don't know that I have the patience for this one, so I will just stare at your pictures a while longer. This is pretty, but i am DYING for you to review the DL Jewel Heist collection!!! I would love this even more without the red glitter. oh man, this is gorg!!! I am SO HAPPY that Lippmann is now at Sephora. I shop online there, but quickly snagged the 2 Sephora exclusives. I love her fall collection of glitter bombs! Gorgeous! Do you have any plans to swatch the Sephora exclusive Lippmann polishes? I can't find pictures of them anywhere!